Bring sparkle to her life with this eye-catching marquise cut sapphire and diamond ring. The stones are set in a polished 9ct gold band. Sapphire is the birthstone for September, making this the ideal gift for any woman born during that month. 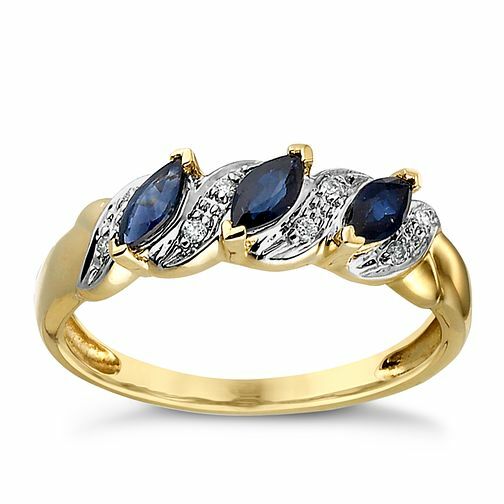 9ct Gold Sapphire & Diamond Ring is rated 5.0 out of 5 by 6. Rated 5 out of 5 by Anonymous from Sapphire and diamond eternity ring. Admired this ring for some time, tried it on, placed a deposit, removed the deposit, went back and admired it again, looked and tried various other eternity rings in the shop. In the end, my husband suggested that if I liked the ring that much, then I could have one. My husband decided to order it online because our local store was miles away, and so having it home delivered made the whole experience that more surprising. Because as soon it arrived, my husband went down on one knee and proposed again. We've been married for just over 5 years, however rather than wait until we were married further down the line, he thought it would be lovely surprise to do it as soon as the ring arrived. Of course, I said yes, but only after I made him wait for a bit. Or until I couldn't turn a corner without him following me around with the ring. It was a gorgeous ring that I admire so much, from the man I love so much. Arrived on time in a beautiful box. However when my husband removed the ring to inspect it, before he chased me round with it. He did say that he felt it bit disappointed, because at first it didn't look the same ring he ordered. Since then though we gave it a quick wipe over, and it looks much better. And is quite comfortable sitting on my finger next to my wedding ring.